I'm getting behind on posting, due to forgetting to photograph the paintings. 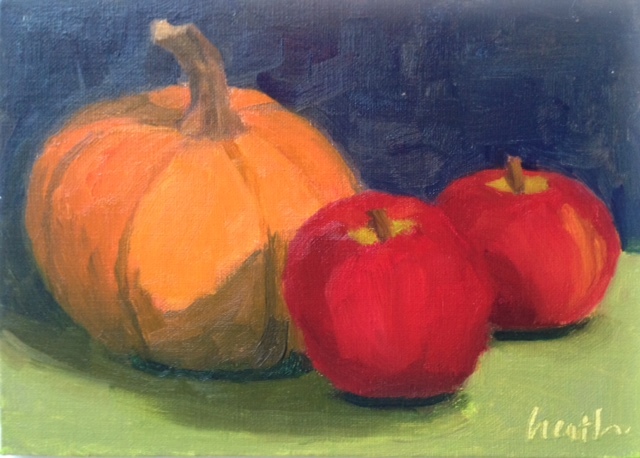 This one is from last Thursday and introduces my new favorite apple, the Autumn Gala. I hope they still have some when I get to the farm stand tomorrow, because I've eaten all of mine! If anyone has any tips for photographing paintings with very dark backgrounds, I'd love to hear them. I'll try retaking the photo once the painting is dry. 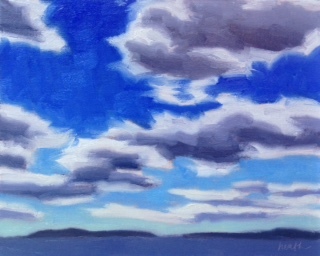 A teacher once said to me, a sky without clouds is a missed opportunity. They can be a great device for composition, and are beautiful in themselves. 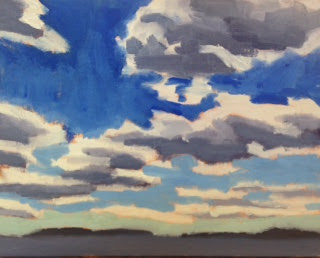 Here's a sky study done from a photo (through a spray spattered windshield on a windy day). The process I used is recommended by my teacher Rob Abele. Tone the canvas, do a quick sketch, and then do a first pass in thin paint as fast as you can. Lightly scrape that, to remove any high points (which contain solvent). Repaint, paying attention to your reference. This is where I have a tendency to fall down, and just fill in the ghost. I get a much better result if I go back to the reference. Finally, in this case, I used my finger to blend the transitions between the different colors and values (top image). Apologies for the different colors. Each pass was photographed with a different light source, and I couldn't bring them all to the same place in Photoshop. The top image was taken outside and so is probably the best. 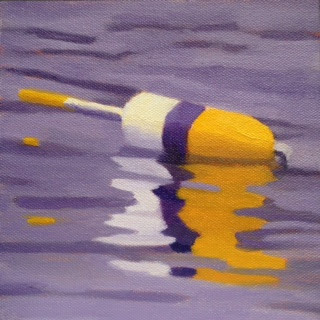 I decided to go with a complementary color scheme for this buoy. It has a wonderful reflection in the photo, which I couldn't resist. I've still got a few more of these to finish, and I'll intersperse them with other subjects and whatever plein air painting the weather permits.